If you can not find what you are looking for please email your question and we'll get back to you. 1.1 What A.E.K stands for? 1.2 How do you say A.E.K? 2.1 When was A.E.K established? 2.3 What is the best performance of A.E.K in Europe? 3.1 What are the colours of A.E.K? 3.2 What is the emblem of A.E.K? 4.1 Where does A.E.K play? 4.2 What is the name of the ground? 4.3 What is the capacity of the ground? 4.5 How can I get to the stadium? 4.6 How can I contact the A.E.K offices? 6.1 How can I keep in touch with what is happening? 7.1 Who is the coach? 7.2 Who ti the president? 7.3 Who are the Club's press/public relations representatives? 7.4 Who is the captain? 7.5 Who is the assistant coach? A.E.K stands for Athlitiki (Athletic) Enosis (Union) Konstantinoupoleos (Constantinople). See the geographical location. How do you say A.E.K? Hear the name in .wav or .au. A.E.K was established in 1924. What are the colours of A.E.K? The colours are Yellow and Black. What is the emblem of A.E.K? The emblem of A.E.K is a an eagle with two heads. One head is looking east, the other is looking west. This symbol was used by the Byzantium Empire (looks left to Konstantinoupoli 'New Rome' & right to Rome), and it is still in use by Greek Orthodox churches. See the emblem of A.E.K. A.E.K plays in Athens, in a suburb called Marousi. See a map of Greece. What is the name of the ground? This year, A.E.K is using 'Olympic Athletic Center of Athens' Spyros Louis (OAKA) because of the reconstruction of 'Nikos Gkoumas' Stadium. 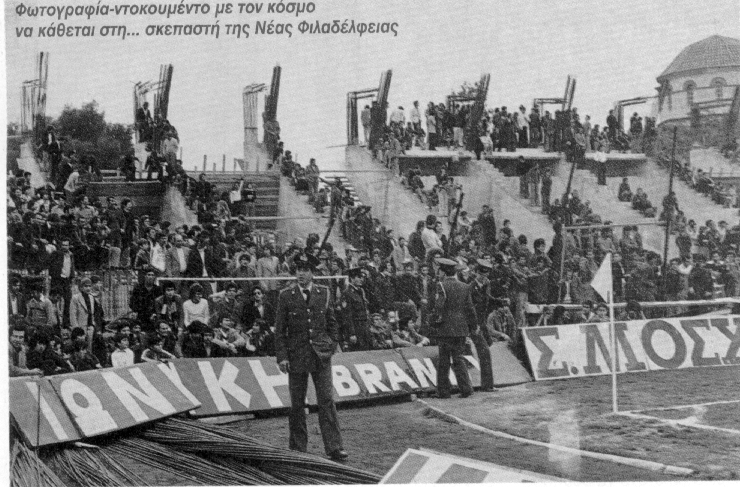 The 'Nikos Goumas' stadium was named after a former prominent president of the club. Take a photo-tour of the stadium. What is the capacity of the ground? This year, A.E.K is using 'Olympic Athletic Center of Athens' Spyros Louis (OAKA) because of the reconstruction of 'Nikos Gkoumas' Stadium.The capacity of OAKA is 65.000. The capacity of 'Nikos Gkoumas' was 22.600. All of the ground is seated but AEK fans tend to stand up, especially at the areas behind the goals. Glance at the famous skepasti. The atmosphere is incredible. See skepasti from another view celebrating a goal against Glasgow Rangers. Some fans at stand21 for the same game. This is stand 21 at a game between A.E.K-Torino. Notice the Union Jack at the right of the picture...The London Fan Club was there!. See Philadelphia on flames when the players come out. By car: Drive from the center of Athens to the north through Leoforos Kifissias street and just follow the signs to the stadium (there are everywhere).If you want to get to the stadium from 'Attiki Odos' you must get out from the exit 11. By bus : Use the 441,550,602,Α7,Β7,X14 X15,X40,M1 buses. How can I contact the A.E.K offices? The offices are in Olympou & Patmou, Maroussi, 15123, Greece. The telephone numbers is +30 210-6855850. The fax is +30 210-6855150. URL: http://www.aekfc.gr/. 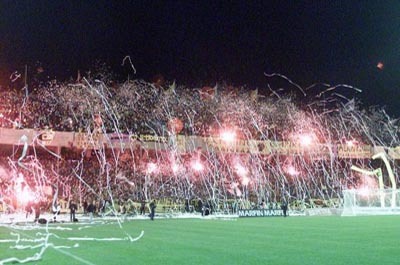 'Skepasti' was the name given to the popular gates 9-11, behind the (southern) goalposts of Nikos Gkoumas Stadium. It means 'overhang' or 'shelter' and refers to the lower tier of the stands. This was where the young (and not so young) supporters of A.E.K used to gather. 'Skepasti' was always full because this was where the very heart of A.E.K beat... 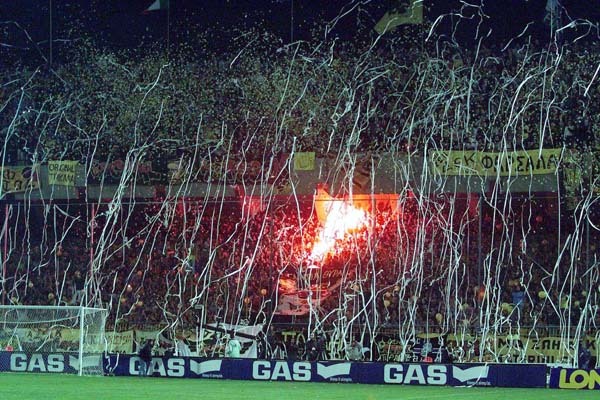 Some pictures of 'skepasti': Against AC Milan in flames as also against Barcelona and Inter. Even during construction 'skepasti' was very popular. Coach of A.E.K is Manolo Jimenez. Who are the Club's press/public relations representatives? Captain of A.E.K is Petros Mantalos. Who is the assistant coach? What is the "official" A.E.K anthem? The official anthem was writen by Stelios Kazantzidis and performed by Mimis Papaioannou.The latest anthem was written by Lefteris Papadopoulos (a famous Greek composer and an AEK fanatic), music by Christos Nikolopoulos and performed by Yannis Fragoulis. The new anthem was broadcasted for the first time on the 2nd of August 1995. Listen to the original A.E.K anthem in .wav or in .au format. What is the best performance of A.E.K in Europe? Τhe qualification for the Champions League (1994-95 season). The victory for Champions League match against ACMilan for the period 2006-2007.